To wrap up the week before Ginny and I have to run down to Savannah for a wedding I’ll drop another case study on you. Jeff Dail is a great guy with a house full of young’ns.. even though he is originally from North Carolina (we won’t hold that against him) Jeff has been selling real estate for the last umpteen years on the side while working in neo-natal departments at hospitals. (might be why he has a house full) I had done some home tours for him a couple years ago. He primarily helps his neighbors out in Hamlin Plantation in Mt Pleasant by giving them 4% brokerage rates to list their homes and he came to me recently after I had put up a multi-user site for another brokerage. Jeff is not unlike 90% or realtors out there.. he has had several websites mostly through companies like advanced access where he paid monthly fees in the range of $30-$250 a month for sites and virtual tours and has gotten little results. I told him the same thing that I tell every client “there is no Make me money button” and you get out of it what you put into it… fancy searches, sophisticated seo results, etc… the ctar framed search works as good as any for actually generating leads and it easy to use with only and $10/month fee from ctar. People like to remain anonymous online and you’re better off generating leads at your kids soccer games than online…besides the results come from google and I already take his brokerages listing straight to google with xml files. I set him up on our grid server at media temple.. ran the domain to google apps to give him email accounts on his domain, set up thunderbird on his computers, setup his contact list (basicly like spring cleaning for email) and stopped all of his real estate spam. 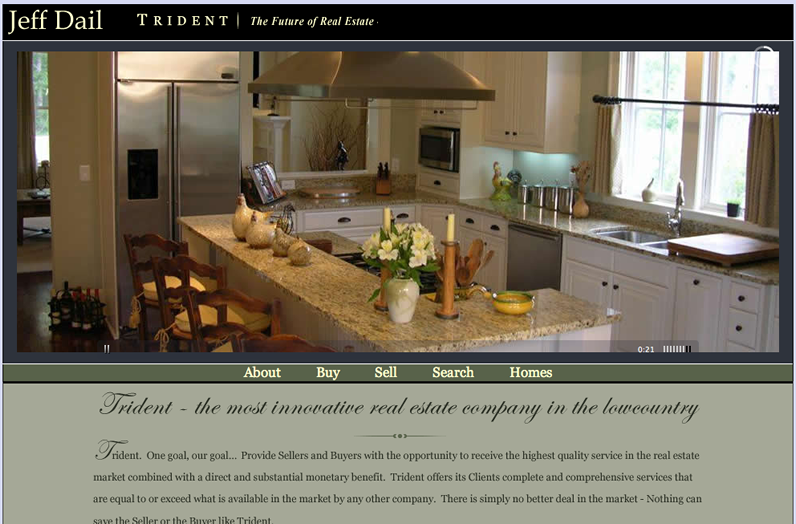 (priceless) I took a bunch of my old images from home tours and some new graphics and mixed it with the existing look and feel of trident real estate and gave him some print materials to work with using templates from Illustrator for brochures and letterhead. I created a way to pull his images and listings via php and another database i have on the server and way for him to create his own pages as virtual tours for his listings using wordpress and some flash galleries… the kicker to all of that stuff is that it only took me fifteen hours and i’m saving him time and money to spend with his rugrats.